Digital Media Organizations face a number of significant challenges in efficiently maintaining accurate forecast and actual Ad Flight Data in Salesforce. RevenueCloud contains a set of features that enable accurate and efficient Ad Flight Forecast and Actual Revenue Management in Salesforce. 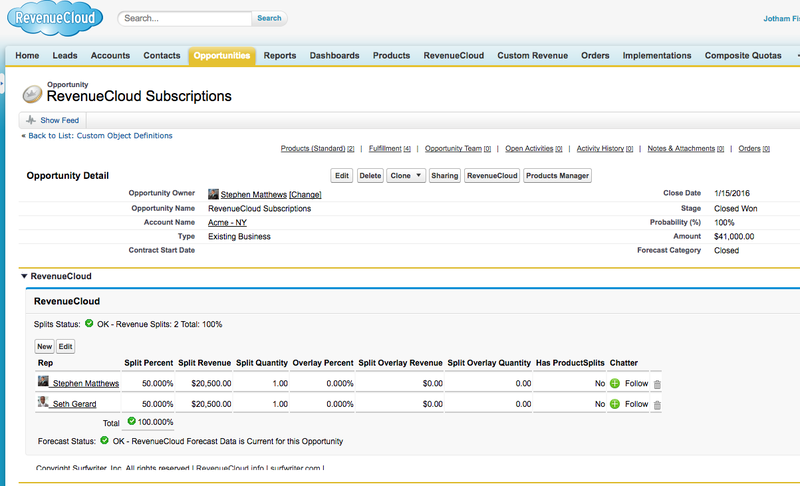 The example RevenueCloud forecast vs. actuals report (below) demonstrates forecast vs. actual ad flight data summarized by rep, product and month for one Opportunity. 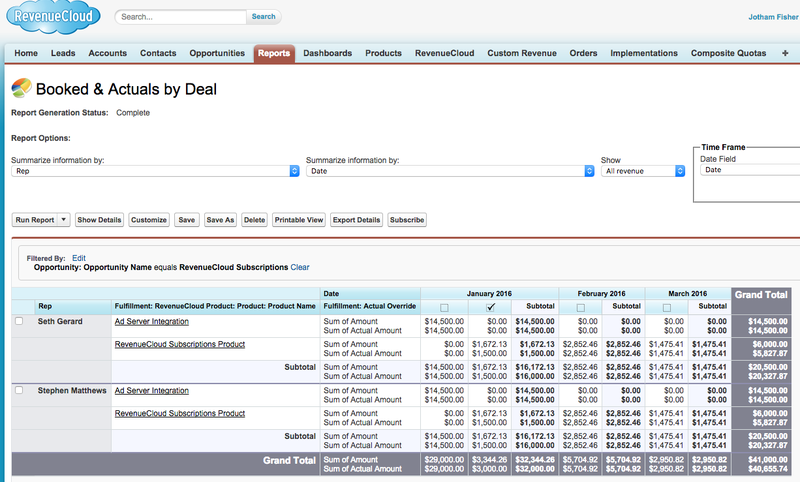 Unlike Salesforce Opportunity Splits, RevenueCloud has a Line Item Schedule Object that is actually split into separate records for each Rep (salesforce user) who is referenced on an Opportunity or Product-level splits. The RevenueCloud Line Item Schedule Object is fully customizable (unlike the Salesforce schedule object), so it offers almost infinite possibilities for click-to-configure customization. 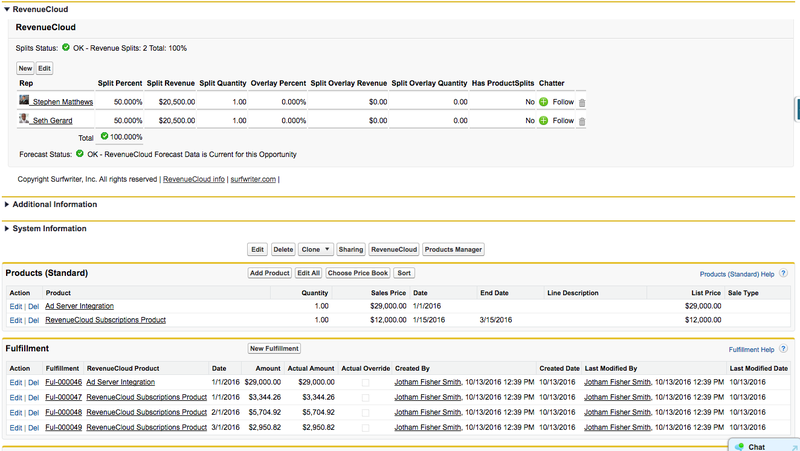 RevenueCloud Opportunity Splits automatically assign a default 100% split for the Opportunity owner and always apply to any products and schedules included in the Opportunity. All split data is updated every time the Opportunity is edited. 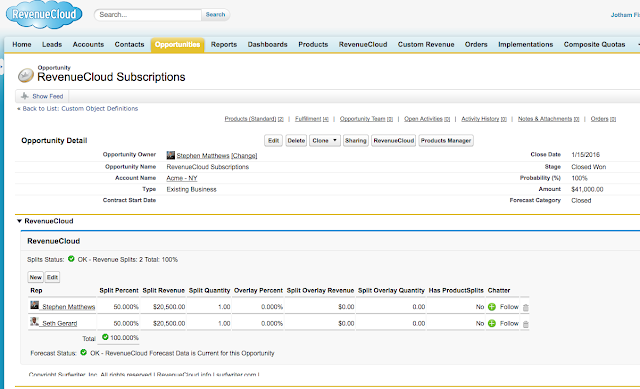 RevenueCloud Product Splits enable you to change the split percentages between Reps (Salesforce Users) on particular Opportunity Products. 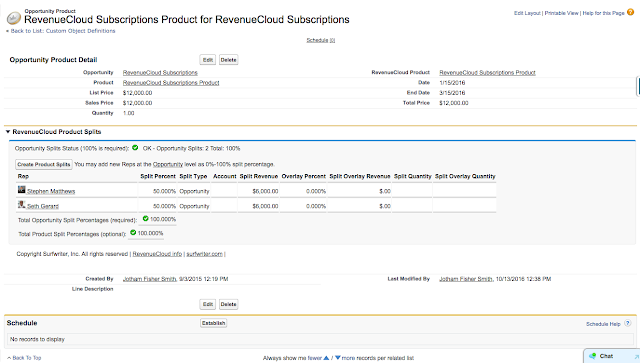 The RevenueCloud Subscriptions Feature enables automatically generating RevenueCloud Line Item Schedules either evenly divided by month (like the standard Salesforce model) or prorated according to the number of days of each month between Start Date and End Date. 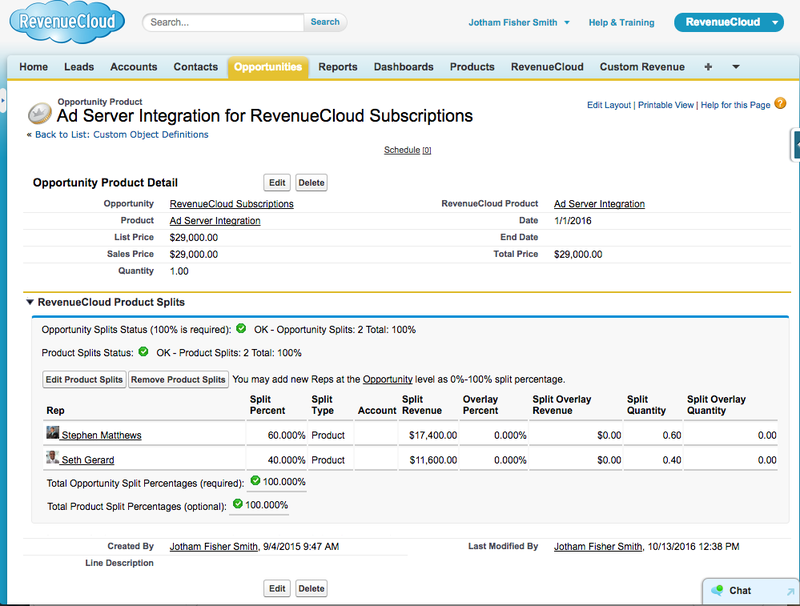 Since the RevenueCloud Subscriptions Feature generates only RevenueCloud Line Item Schedules on every Opportunity Product Save and not Salesforce Standard Schedules, The standard Quantity and Sales Price fields on Opportunity Product will not be read-only as would be the case with Salesforce Standard Schedules. The Quantity, Sales Price, Date and End Date may all be edited simultaneously and RevenueCloud will re-write the prorated or evenly divided schedules on every Save! 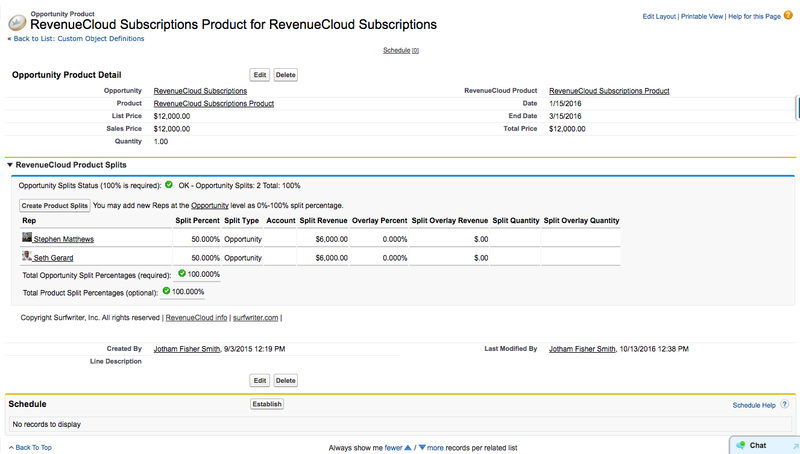 The screen shot below shows the RevenueCloud Line Item Schedules that were automatically generated by the RevenueCloud Subscriptions Feature when the Opportunity Product (screenshot above) was saved. Schedule settings such as which products to schedule, whether to prorate or evenly divide etc., are managed in your org. The RevenueCloud Fulfillments Module enables generation of monthly roll-ups of Scheduled Revenue by Opportunity Product with inputs for Actuals. Note the related list of Fulfillment records in the screenshot below. There is one entry for the Ad Server Integration Product representing revenue forecasted for one month and 3 entries for the three month prorated subscription. The amount of scheduled revenue for the Opportunity Product and month. Lookup to Revenue Product which contains all Opportunity Product and Product2 fields & information. Fulfillment splits for Reps reflecting their percentage of all included currency and numeric values according to the associated Opportunity or Product-Level Splits. The screen shot below shows the same Fulfillment entry with an Actual Amount entered and the checkbox checked. Note that before the Actual amount was entered in the Actual Override field (above), the Actual Amount for reporting purposes was the forecasted amount and after entering the Actual Amount and checking the box, the Actual amount has been adjusted to what was entered. This data model supports "Blended" reporting on forecast and actuals while also always maintaining discrete records of precisely what was forecasted, what was Actual and which records have been updated with Actuals (via the checkbox). Contact us today for more information or a demo on how RevenueCloud can help you achieve the Revenue Management and Reporting you want in Salesforce!